>It’s been a difficult month for my eighty-year-old mother. 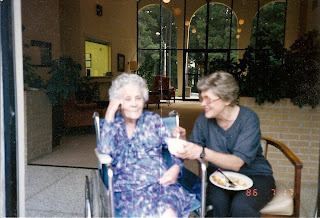 If you’ve been following my blog, you know she fell and broke her hip, spent a week in the hospital, spent a month in rehab, and yesterday I moved her to Lakeland Nursing and Rehabilitation (right). I haven’t made the final decision that this will be long-term, but I think the chances that her mental status will improve enough for her to return to assisted living are slim. Not that it’s a given, when you break your hip… I visited with a lady who lives in Mom’s assisted living facility yesterday who also fell and broke her hip. 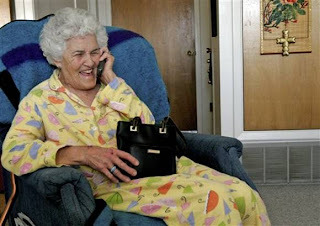 After three weeks of rehab, she returned to assisted living, with the only change being she uses a walker for support. I asked her where she did her rehab, and she said Lakeland… the nursing and rehab center that I finally got Mom into yesterday. They didn’t have any beds available a month ago when Mom was leaving the hospital. I cringed to think that she might be walking by now if she had been in this facility sooner, but what can you do? “You would say that!” she was almost in tears now, and Sondra, from Comfort Sitters tried to distract her with finishing up dressing her for the move while I packed everything from her drawers and closet, and took all the posters and cards and pictures off the walls. The TV had to be unhooked (and a third appointment made for Comcast to hook her up again) and everything loaded in my car. “Here, put some in the pockets of your sweater, sweetie,” Sondra offered. This brought tears. The purse represented independence, and Mom saw for the first time that she had lost her connection with the plastic cards in that wallet. I just couldn’t risk her losing them (or having them stolen)…. So I made copies of her Social Security and insurance cards for each facility and kept the originals with me, along with her debit card for the bank account I keep a small amount of spending money in for her. I check it online, and she hadn’t used that card for three months. She rarely goes to the drug store or other errands on the shuttle any more, and I’m not sure she knows how to use the debit card any more. “Mom, you’re going to have to trust me about this, I love you, and you need to go to a place where they can help you get your hip healed so you can walk again.” I tried to hug her and smoothe her hair, but she slapped my hand away. “Quit touching my hair!” This was a level of anger I hadn’t seen in many years. I can’t imagine how it must feel to have no control over decisions like these. The responsibility I feel is overwhelming. As we pushed her down the hall to the elevator, she held a small pillow in her lap, a poor substitute for her purse, but something to hold onto, nonetheless. I’m thinking I need to put a few non-valuable items in her purse and bring it back to her on my next visit… its presence could be comforting. Or, it could make her anxious about why the wallet is missing. Some of these decisions are just crap shoots. and then posing for a similar one,(left) this time Mother with me, ages 80 and 57. The cathedral windows in the lobby give a view to the tall pines outside on the front, and there’s a lovely enclosed courtyard in the middle. Once we got Mom settled in her room, hanging pictures on the walls and along the windows, it began to feel homier. But she kept asking when we were going home. It wasn’t sinking in that this was where she was staying. Near the end of an exhausting day, a surprise visit cheered us up. Derwood Boyles, my father’s roommate at Mississippi State (in the 1940s) came by to see Mom and brought flowers. Derwood has been a community leader in Jackson, and a very kind and spiritual man. At one point when Mom said she didn’t feel like she was worth much at her age, he said, “Well Moses was about 80 when God used him to do mighty things. But he had to have some help, holding up that staff. We all need help from time to time.” Here’s Derwood and Mom visiting in her room. “You’ll have supper in the dining room here tonight, Mom.” I pointed behind us, around the corner towards the dining room. She’s lost ten pounds in the month since she broke her hip. And she’s picking at her food more and more…. no longer enjoying some foods that have been favorites most of her life—like grits—and “forgetting” that she’s hungry. Dementia does that. The staff will be alert to try to keep her nourished and hydrated, but they can’t force her to eat. She is allowed to have a glass of wine with dinner, once the doctor “prescribes” it and I provide the ongoing supply for her. I think I want to put that in my will—that whoever is taking care of me when I can no longer make choices for myself will be sure I get a glass of wine every night! During the month she was at the other facility, I “hid” a stash of single-serving, screw top bottles of wine in her closet and instructed the private sitters to pour her a cup each evening. We won’t be using private sitters at Lakeland, but it’s nice to know Mom’s evening cocktail will be served with dinner. I’ll be heading back to Jackson next Wednesday to take Mom for another checkup with the surgeon. Evidently her hip is healing more slowly than he had hoped, for some reason. The physical therapist at Lakeland spoke with him on the phone today, to clarify Mom’s rehab orders. In fact, within an hour of my returning home to Memphis this afternoon, I had received phone calls from four different people at Lakeland, asking for more information about Mom’s “social history” and updating me on her progress. The head of social services even gave me her email and says she checks it frequently. The two hundred miles between Jackson and Memphis just shrank considerably. I am so thankful for the good people at Lakeland, whether or not it’s Mom’s last stop this side of heaven. Before I close… a little over a month ago I posted about River Jordan reading from my essay, “Are These My People?” on her weekly radio show, “Backstory” on October 4. Something came up and she wasn’t able to read it, so she’s going to read it tomorrow afternoon: Saturday, November 15, between 4 and 6 p.m. Tune in to 98.9 WRFN-LPFM, “Radio Free Nashville,” or click here to see three ways to listen online, instructions for listening through your phone or on TV Cable Channel 10 throughout the Davidson County (Tennessee) area. It’s a great show, featuring various writers and musicians each week. River is generous with her time, and likes to encourage fledgling writers (like me) with a shout out from time to time. Thanks, River!